Stuart Pigott, Best White Wine on Earth: The Riesling Story. Stewart, Tabori & Chang, 2014. 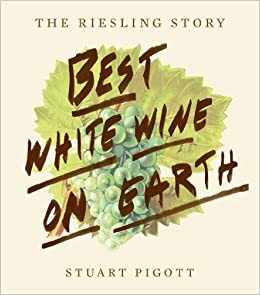 I was surprised when I saw that Stuart Pigott had titled his new book on Riesling “Best White Wine on Earth.” Best white wine? If you know Pigott or have followed his work you have to guess that the original title was “Best Wine on Earth.” Someone must have talked him into the more limited claim — or maybe I’m wrong and there’s a red wine that he thinks is better than Riesling. But I don’t really believe this. I run into Pigott every few years when he comes to Seattle to serve as master of ceremonies at the Riesling Rendezvous meetings that Chateau Ste Michelle and Dr. Loosen organize and his passion for this wine is beyond question. He writes about Riesling a lot on the web and in books, but it has been a while since he’s published a book in English (he lives in Germany these days). You can see that he wanted to make up for lost time here. The book is just crammed with information, opinions and interesting ideas that will reward the diligent front-to-back reader and also the enthusiast who likes to dip in here and there. The book’s organized in three main parts. The first two chapters tell you just about everything you might want to know about Riesling the grape and the wine, including a rather thorough break-down of where the aromas, textures and flavors come from and why. Along the way you will take the Stuart Pigott Acid Test, learn the truth about sulfur, cork and screw-caps and encounter documentary evidence that good Rieslings once commanded higher prices than first-growth Bordeaux wines. I’m sorry for Riesling’s diminished status (think of it as the Rodney Dangerfield of wine), but I have no complaints about price — Riesling is one of the great bargains of the wine world today and I take advantage of that fact whenever I can. The book’s core is a tour of Planet Riesling, which you would expect to begin and end in Germany, but it doesn’t. One of Pigott’s themes is that Riesling really is a global phenomenon, with fine wines of different styles being made in many parts of the globe. So we begin in the American northeast — New York, Ontario and Michigan. There are stunning wines being produced here and I appreciate Pigott drawing attention to them. Next stop is the west coast — Washington, Oregon, British Columbia and California. The section on the “Great Riesling Desert” is especially clever — who would think that great Riesling would come from the arid vineyards of Eastern Washington? But they do and Pigott explains how and why. The tour continues in Australia and New Zealand then on to Austria and finally Germany. Well, actually Germany is not the very last stop because it is followed by a chapter on “Riesling’s Lone Rangers” that goes east (Eastern Europe) and south (Chile, Argentina and South Africa). It is hard to complain about coverage in a book that spans so much territory, but I wish there had been room for more detail about Chile and South Africa here. I’ve had some stunning wines from both places, especially the South African Rieslings from Elgin (shout-outs to Paul Cluver, Spioenkop, and other Elgin Valley wine farms). Wine enthusiasts love lists and Pigott feeds this thirst in the very last chapter that presents the author’s global Top 100 Rieslings divided into groups of 20 by style with a final listing of the best extreme “Riesling Blade Runners.” But before he lists his Top 100 Pigott gives us a shopping list. What are the best Rieslings that you can buy for less than $15 or £10? You will probably not be surprised to know that six of the ten value wines are from Washington State (three from Riesling specialist Pacific Rim, two from Chateau Ste Michelle plus Charles Smith’s “Kung Fu Girl”), two are from Germany (the Leitz “Eins-Zwei-Dry” and “Dr. L” from the Loosen Brothers) and one each from New York (Red Newt Circle) and Ontario (Cave Spring Niagara). Germany may be Riesling’s motherland, but it is clear that America is its successfully adopted home, especially when it comes to the quality/price ratio. There’s a lot of particular things to like about this book, but as someone who has written extensively about globalization (see my 2005 book Globaloney for example), one of the things that I like best is Pigott’s general attitude toward the global spread of Riesling culture. Rather than doing as some would and finding fault with this or that he embraces the opportunities the global mix creates. He does this specifically in a section titled “What is Positive Globalization and How Can You Do It Too?” but really it’s infused throughout the enterprise. Do you have to love Riesling as much as Stuart Pigott to enjoy this book? Of course not! But his enthusiasm is contagious and its hard to read this without feeling that familiar urge to run to the wine shop and come home with a few bottles to explore. Riesling of course — after all, it’s the greatest white wine on earth. Surefire holiday gift idea: this book plus one of the wines mentioned in it. This book makes me thirsty for more than wine. I’ve heard through the grape-vine that John Winthrop Haeger is working on a book about dry Riesling around the world. Can’t wait to read it when it’s finished. a book I think I need in my stocking…two of my favorite whites lately are Austrian Rieslings (Rudi Pichler and Prager among others) and I just tasted a Basque white that was 80% Hondurrabi Zuri (the grape for Txakoli) and 20% Riesling and it was crazy but awesome! and so many people will say “I don’t drink white wine”, what’s wrong with these people?!?! Thanks for this, Mike. Bought the book and I’m enjoying it. Fantastic review I’ll definitely check out this wine. Its got to be delicious. Amen to that. Riesling, sherry, madeira: a holy trinity of devilishly well priced wines!